A business which folds after a decade might not represent success to some. 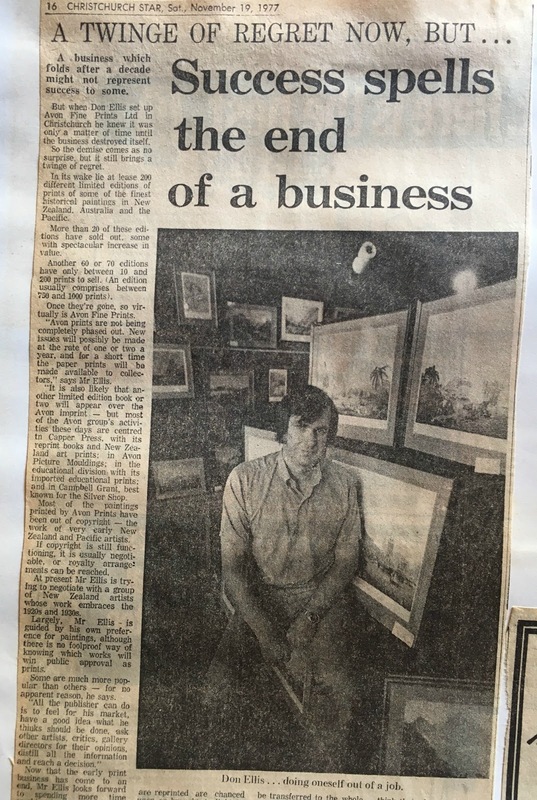 But when Don Ellis set up Avon Fine Prints Ltd in Christchurch he knew it was only a matter of time until the business destroyed itself. So the demise comes as no surprise, but it still brings a twinge of regret. Once they’re gone, so virtually is Avon Fine Prints. Most of the paintings printed by Avon Prints have been out of copyright - the work of very early New Zealand and Pacific artists. If copyright is still functioning, it is usually negotiable, or royalty arrangements can be reached. At present Mr Ellis is trying to negotiate with a group of New Zealand artists whose work embraces the 1920s and 1930s. Largely, Mr Ellis is guided by his own preference for paintings, although there is no foolproof way of knowing which works will win public approval as prints. Now that the early print business has come to an end, Mr Ellis looks forward to spending more time working with Capper Press, a business which specialises in the reprinting of old books - particularly those which are extremely specialised. Among reprints to date are Freda du Faur’s book Conquest of Mt Cook, W.S. Green’s The High Alps of New Zealand, Sir Henry Brett’s White Wings, T.H. Pott’s Out in the Open, and numerous others. All these have a limited demand, but are fascinating in their own right, Says Mr Ellis. Among those he has personally found most entertaining and interesting are a couple on herbalists and doctors, and one called Colonists’ Guide: an Encyclopaedia of Useful Knowledge, a book which includes advice on how to cook, how to grow vegetables, and generally, how to stay alive. Many of the books which are reprinted are chanced upon or brought to light by members of the public; others are selected by the firm. Without a reprint many of them would either disintegrate through old age, or else perhaps be lost in archives. Begun as a hobby, Avon Fine Prints is the only company of its kind in the world devoted wholly to the publication of historical maps, prints and charts in limited editions. Until this month the prints were available unframed, but now sales of framed prints only will be made. Why the change? Says Mr Ellis: “The selection and publication of limited edition prints is an intensely personal choice; there are very few historical paintings left to do, and the prints done cannot, of course, be reprinted, so that this side of the business is coming to a natural close.” The balance of the limited edition print stocks are to be transferred to the wholesale and retail framing division of the Avon group of companies, the Picture Shop, in Hereford Street. People buying the early limited editions did so in the knowledge that once the edition was sold out, there were no more available. It was a sought-after commodity. “The problem which occurs, however, is that at some time you must run out of suitable paintings from which to take prints.” And with this prospect looming, Mr Ellis started Capper Press about five years ago. Mr Ellis’s interest in art stems from his childhood. As a young man he built up quite a collection of early New Zealand paintings and eventually decided to start his own business in prints. The Auckland series was one of the first printed and “it went like a rocket”, says Mr Ellis. Consequently, the business was soon on a firm footing, and today can claim credit for the publication of at least 200 different prints.